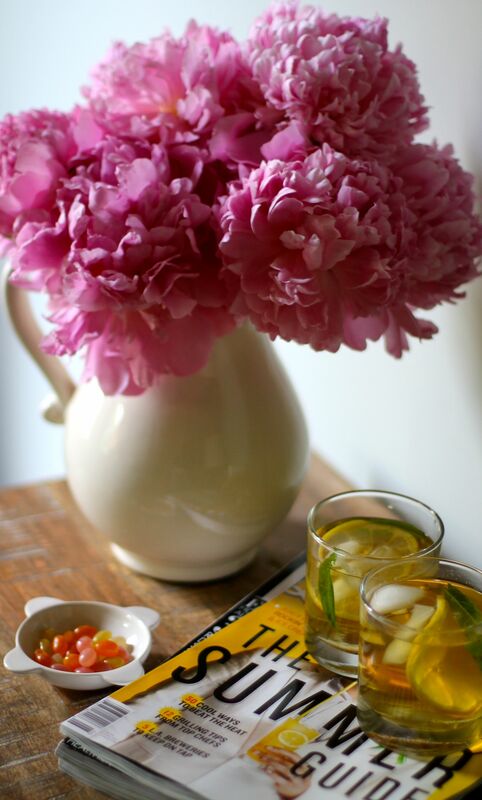 Peonies are everywhere: at the farmers market, grocery store, and in beautifully landscaped yards. I couldn’t resist buying a couple of bunches and sticking them into this old water pitcher. Their color is instantly uplifting, and the scent is pure bliss! A bunch of peonies in your house this weekend will add a pop of spring color to a gathering of friends, or simply brighten your home for your personal enjoyment. Mix up a big pitcher of “summer water” or iced tea (here I used Tazo Zen green tea, then added lemon verbena from my garden and a slice of lemon), grab a summer magazine, and kick back to enjoy a long weekend.